Kristy's Awesome Surf Adventures: Kristy Murphy's Surf Adventures - Montauk, NY! Kristy Murphy's Surf Adventures - Montauk, NY! We made it and so did the boards! Shocking, not a single ding! Islip Airport in Long Island. Pre-clinic surf at secret spot! Always full of aloha, local girl Cat Lippincott showed us around and took us to a nice little beachy! Friday's SUP Session. Leslie shows us SUP air guitar! Da ladies waiting for their turn on the SUP board. Maggie strokin' across the lake. The crew charging the SUP through a windy afternoon! Beach Camp at Ditch Plains. Not perfect conditions, but the ladies charged and made the most of it! Boss lady taking a beach break. We just wrapped up our second annual Montauk Sessions in Montauk, NY! An awesome group of ladies came out to be a part of our weekend warrior surf clinic. The northeast dished out a day of rain, a day of rain/sun, then finally on Sunday came SUNSHINE! The waves went from challenging to fun, and despite the crazy weather we all had a blast. When the waves were too choppy and big, we went Stand Up Paddling on Lake Montauk. The lake offered a protected bay out of the wind, where we could get the hang of the the SUP boards and practice paddling techniques. After the paddle we hit up the famous Surf Lodge for some great food and awesome mojitos! On Sunday, the surf was perfect for everyone to really push their surfing skills to the next level. Everyone conquered fears, perfected turtle rolls and got awesome long rides! The sun and perfect little peeler waves lasted thru Monday and Tuesday, so the ladies scored some super ultra mellow days. Big, Big Thanks to all our sponsors who helped make the Montauk Sessions a success! 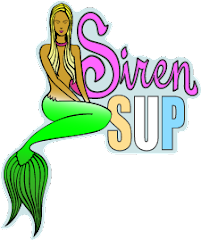 Siren Surfboards by Channin, Costa Del Mar Sunglasses, Keep -A-Breast, Wildcoast and special thanks to our good friends Cat Lippincott and Steve White for all the great local knowledge! Thank you Kristy and Cat for your encouragement as I wrestled with my fear following the weekend's nor'easter. I have never been out so far past the outside break and the size of the swells, for me, were overwhelming. Thank you both for your enthusiasm and hard work in pulling the weekend together.